Whether you’re cutting your crop or your customers’ crops – you need to get a lot done in a tight time frame. 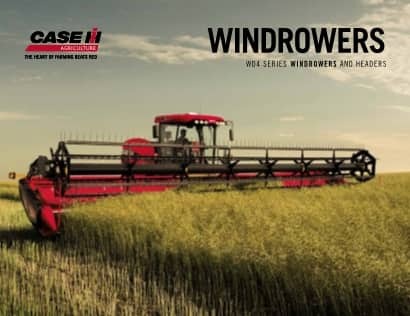 The performance of Case IH WD 4 Series Windrowers is second to none with a size that will suit every application and extends to many other innovative, efficiency-improving features. The end result? An unmatched system that allows you to move faster through the field and cut more... all day, every day. Here’s a perfect fit: the adjustable air suspension seat and ride suspension sensor adjusts to suit any operator and provides greater comfort and optimal control. Cab suspension and the suspended rear axle promise to provide a smooth ride over the roughest terrain, leaving you less fatigued at the day’s end. The fact remains; a windrower is only as good as its header. Case IH has you covered. Case IH RD 3 Series Rotary Disc Headers are designed for customers who demand high quality, nutrient rich hay, greater productivity, decreased operating costs, and reduced downtime. HDX sicklebar headers are available in 14ft or 16ft widths. Draper heads are available in 30ft or 36ft widths. When the crop is ready and the weather is cooperating – downtime is not an option. And when you’re cutting, efficiency and productivity are pivotal. That’s why Case IH WD 4 Series Windrowers make servicing simple, with quick and easy on-the-go productivity-enhancing features ensuring you’ll be making the most of your in-field time. Keeping your WD 4 Series Windrower hard at work in the field is easier than ever before. For one thing, the fuel fill can be easily reached from the ground. No more climbing up steps, dragging hoses across the machine to fill the tank. And with a fuel capacity of 120 gallons (454 litres), you can work all day long.